The last two days were pretty hectic and tiring here. After my short appearance in Wednesday evening's 10 pm TV news, I had another TV-crew visiting me yesterday afternoon, for a longer item in NOVA, a well-watched program on Dutch national television providing in depth backgrounds to some news topics of the day. There was a studio guest too: the resident space related Dutch TV expert Piet Smolders. Amongst others he raised the possibility of nuclear fuel being on board (something I had avoided), and mistakenly says this is the first time the US shoots down a satellite (they did it earlier in September 1985, targetting the Solwind satellite). Earlier that day, at about 7:15 am in the morning, I was called out of my sleep by the Dutch NOS radio news for a comment to the news of the successful ASAT attack in the 8 am radio news. 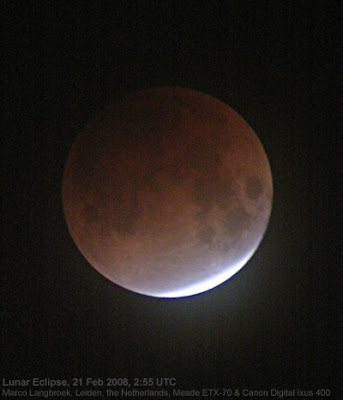 I was still quite groggy, as I had been up at 4 am to watch the lunar eclipse! A local radio station called too that afternoon, but by that time I was so tired (and had an agreement with the people from NOVA not to comment elsewhere before the broadcast) that I declined. But I have been lucky to have seen and photographed anything at all, most Dutch and Belgian observers missed it completely due to the weather. Maar buiten dat, ga zo door! Het kan geen kwaad om een beetje zichtbaar te houden wat er allemaal gebeurt. Al eens gedacht aan een 'donatiefunctie' op je website? Alles kleine beetjes helpen en ik denk dat er genoeg mensen zijn die graag zien dat je door gaat met wat je doet.